Starting in 1948, Soichiro Honda filled an important niche in post-World War II Japan by building motorized bicycles, and his Honda Motor Company quickly grew to become one of the world's largest and most successful motorcycle manufacturers. This success allowed Honda to expand into building small cars in 1960. The energy crisis of the 1970s made Honda's efficient Civic, with its low-emission CVCC engine, a best-seller in many markets. The mid-size Honda Accord, introduced in 1976, also added to Honda's worldwide reputation. In the 1980s, the company started building cars in the U.S. and Canada. Soichiro Honda had always been interested in motorsports, and by 1961, his motorcycles were international winners. He sought the same success in automobile racing at the highest level— in Formula One and Indy Car racing. From 1964-1968, Honda campaigned its own cars in the Formula One World Championship, and since 1983 has supplied engines to other constructors. In 1988, Honda-powered F1 cars won 15 of 16 races. In 2006, Honda once again began running its own cars in the world-famous championship. The partnership between Honda and Mugen began with the CRX. It was an inevitable collaboration given that Mugen was formed by Hirotoshi Honda – the son of Honda founder Soichiro Honda – and veteran racer Masao Kimura. 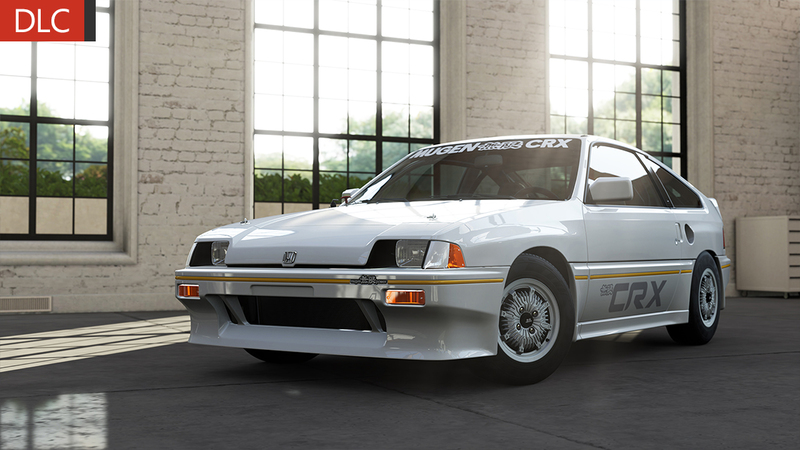 The CRX, or CR-X as it is called in Japan, carried an aggressive effort to establish Mugen in the United States. At the time, any Honda dealer could order and sell Mugen parts, and a select few became Mugen Performance Centers. The program only lasted three years, but yielded a handful of uprated Mugen CRXs and many street-tuned Hondas. 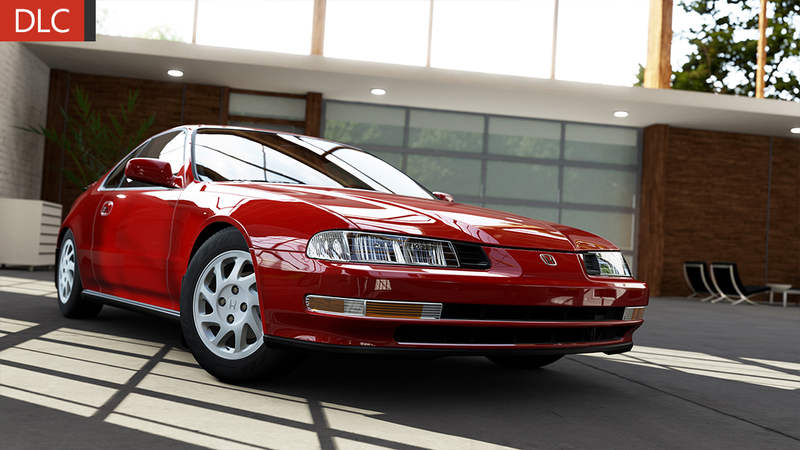 Dressed in the Mugen body kit, the CRX’s short, stout lines are tastefully enhanced without complicating them. A trademark feature of the Mugen CRX is the twin-pipe muffler or “Silencer Set.” With nearly 120 horsepower, a limited slip differential, and weighing in at a mere 1,800 pounds, the Mugen CRX is a thrill to drive and inspired a new generation of Honda tuners. Mugen has gone on to contribute to Honda’s racing success in Formula One and sports car racing, but it all started here with the CRX. There’s something special about the NSX-R. Not the aluminum monocoque chassis, or the mid-mounted high-output V6, although those are definitely technological marvels for the time. Nor is it the advanced VTEC variable valve timing system, or the even the special NSX-R-only titanium connecting rods. 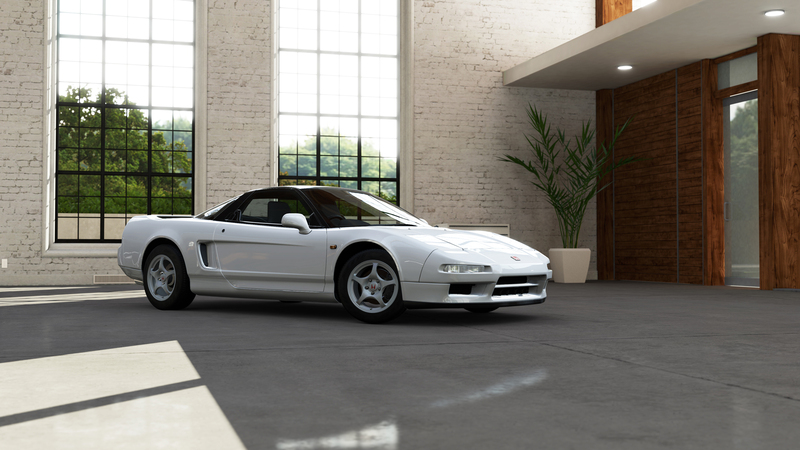 It’s that the NSX-R is the very first car to ever wear the now-legendary Honda “R” badge. 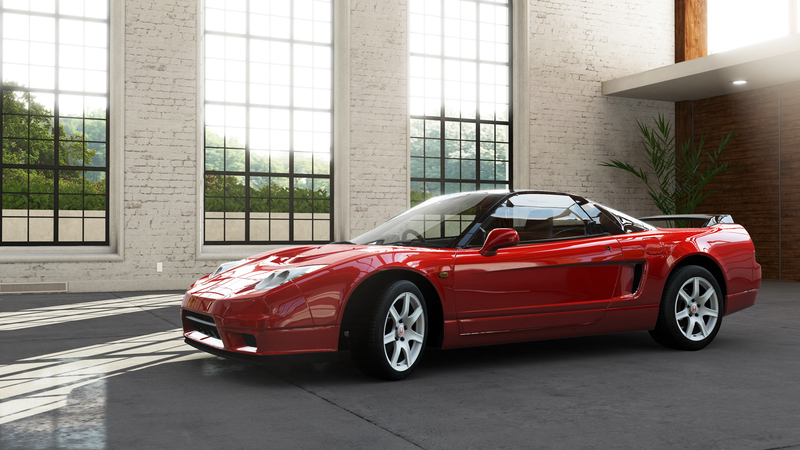 Developed with input from the famed F1 driver Ayrton Senna, the NSX-R is a refinement of the already advanced NSX, achieving higher performance mainly through weight reduction. Luxuries such as air conditioning, soundproofing, and electric windows were tossed out, and the engine was beefed up to withstand the stresses of track-day sessions. Wearing the same championship white paint as the pioneering Honda F1 cars of the 1960s, the NSX-R also has a purity of design that complements its precision driving dynamics. The first Type R is undoubtedly one of the best. The fourth generation of the much-loved Honda Prelude saw the demise of pop-up headlights, but brought new-found performance in the form of the 2.3 H23A1 motor. Delivering the most horsepower yet (around 160) the Prelude Si could no longer be classified as a compact car in Japan. With its new luxury classification came other changes to some of the trademark appeal of the Prelude. The Japanese VTEC Si had in in-dash TV as an option, a visionary design when you consider the prerequisite in-dash screens of today’s cars. On the exterior, the rear end was rounded rather than squared off and sat high in comparison to previous models, while the front fascia was wider. 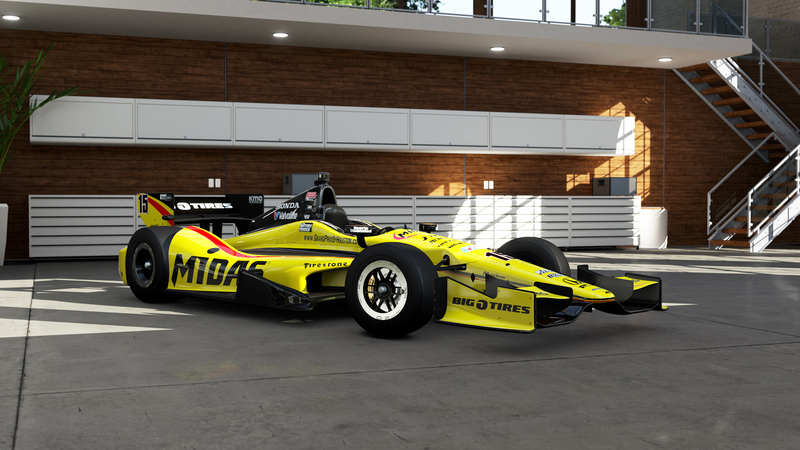 Tune up your “Lude” and represent for the Honda fan-boys (and girls) of Forza Motorsport 5. The “championship white” paint. The five-lug wheels. The red Honda badges. The stance and the sound. 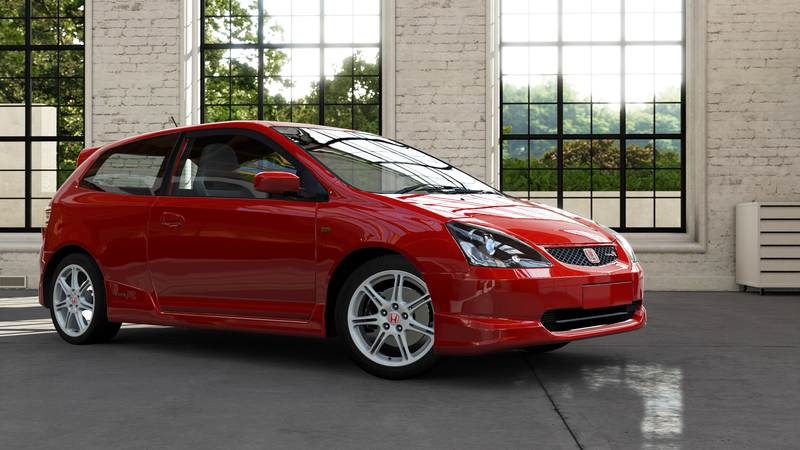 The Type R theme is often imitated, but the original limited-production Type R can’t be duplicated. Few similarly-sized hatchbacks can keep up with the Type R’s B16B motor, carrying on a Honda tradition by making an astonishing 182 horsepower naturally, through careful hand-porting of the head and increased compression. The interior is stripped of unnecessary material to bring the EK hatch down to fighting trim, and the chassis is specially seam-welded for greater rigidity. Honda specialists also threw every trick in the book at the EK9’s already phenomenal full-double-wishbone suspension, nearly eliminating understeer for perfect balance, making it nearly as fast as an Integra Type R on most road courses. 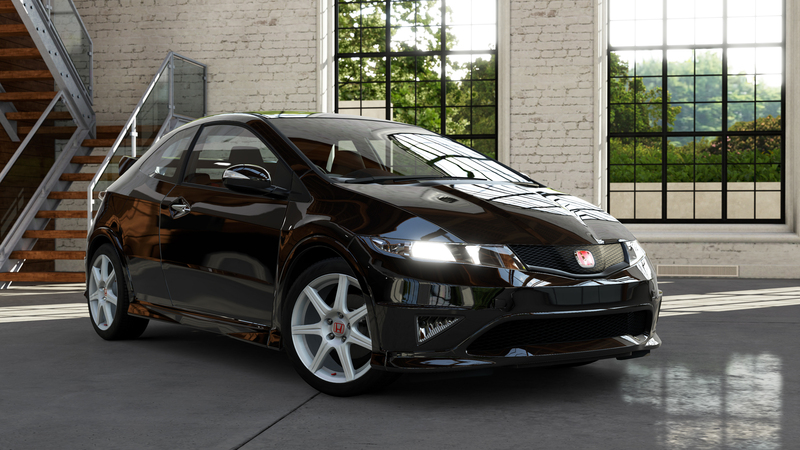 The only way to truly appreciate the transformation the simple Civic went through to gain the coveted Type R badge is to hop behind the wheel and unleash it in any of Forza 4’s tracks—but the twistier, the better. 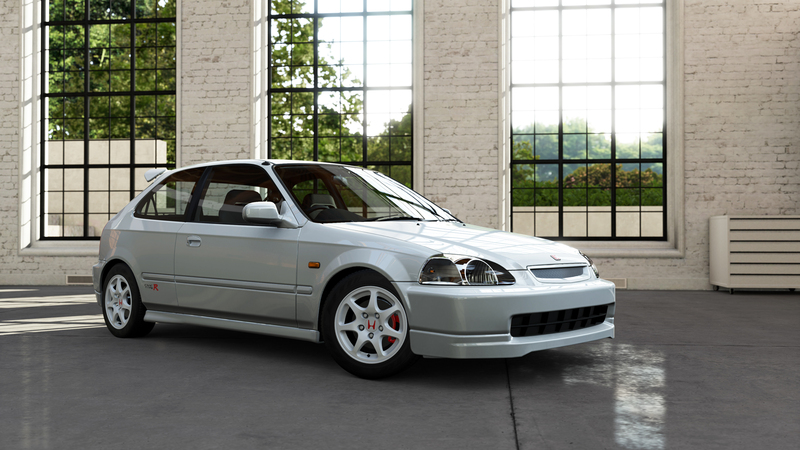 Whether you appreciate the EK9 Type R in its original factory-modified form, or unleash all of your tuning and painting skills on it to transform it into the ultimate expression of your Honda fantasy, is completely up to you. Hard to tell by looking at it, but this most Japanese of Civics, the glorious Type R, rolls not out of a factory on the Pacific island nation but instead out of an Atlantic island nation—the United Kingdom. Honda has a plant in Swindon that produces cars not only for Europe, but also to ship back to Japan. The second-generation Type R is one of a new generation of globe-trotting Hondas, and while the JDM and EDM versions differ slightly, they’re both just as much Type Rs as their Japanese-built predecessor. That means that the chassis is seam-welded for additional strength (a Type R trademark), fitted with a 212 horsepower version of the excellent “K20” motor found in the Acura RSX, and a shifted via a slick 6-speed transmission. The cosmopolitan attitude of the Type R doesn’t mean it’s forgotten its roots, either, as 60 mph comes in just 6.2 seconds and the suspension is tuned to allow for incredibly precise handling without punishing the occupants. Of course, the Type R is as tunable as any other Honda product, so if you want more power or better handling than the great stock setup, the Upgrade Shop is a button push away. In the thirteen years since the original NSX-R was introduced, composite technology advanced significantly. So when Honda wanted to produce a second generation version of their NSX-R, they had additional materials like carbon fiber with which to shave weight off of the mid-engine supercar. Many body panels, including the hood, rear spoiler, and deck lid, were redone in the woven stuff. Like the original, things like air conditioning, the radio, and sound deadening materials were left off. Not content just to have a lighter car, Honda had the highly skilled line technicians hand-build each motor to an exacting standard, weight-balancing and matching each component to produce a smoother, more responsive engine. Honda plays coy about what the NSX-R truly produces, but those in the know will tell you it’s more than the 290 horsepower figure often quoted. Whatever the power figures are, there’s no denying that this is a machine of unprecedented precision, which in the hands of a skilled driver can knock out a lap of the Nürburgring Nordschleife in well under eight minutes. This rev-happy roadster has always been the life of the party among Honda lovers as well as those looking for a candidate for the occasional autocross or track day. The S2000 CR takes all that is good about the S2000 and then, following Colin Chapman’s rule of “adding lightness,” arrives 90 pounds lighter than the standard version. Adding some stickier rubber (wider in the rear), a lower ratio steering rack and stiffer springs, the CR is begging to be pushed hard into any turn that comes its way. Fighting gravity on the skid pad has always been a strong suit for the S2000, and now the CR brings even more downforce for high-speed corners with its revised body kit. The look it presents is functional, reducing the overall coefficient of lift significantly and giving the CR a racy look to match its intents of being a weekend track car. 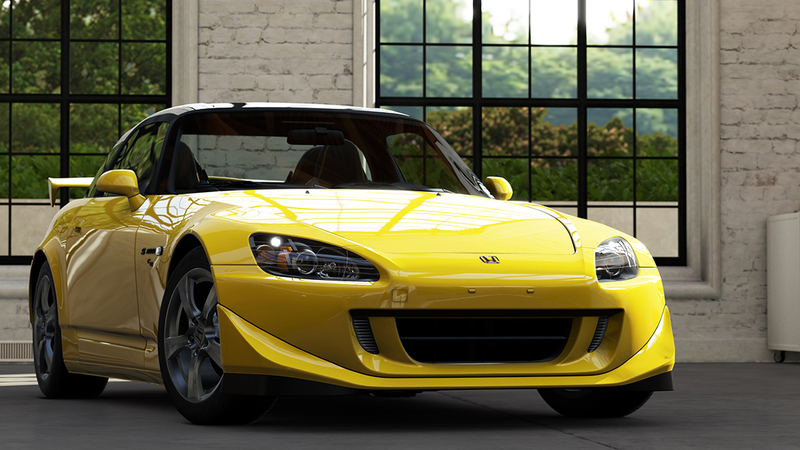 Limited production numbers make this S2000 a rare find on the road; thanks to Forza Motorsport 5, you can now say you drove one. The Honda powered Dallara driven by Graham Rahal was a consistent contender in the 2013 Izod IndyCar Series. Starting all 19 races and finishing 16 of them with two top five finishes including second place at Long beach. Rahal Letterman Lanigan Racing is owned by three-time IndyCar Champion Bobby Rahal, CBS Late Show host David Letterman, and Mi-Jack co-owner Mike Lanigan. The team has been competing for over two decades and has compiled more than 30 victories. The direct-injected turbo V6 Honda engine of the Dallara delivers exhilarating power and can push the car to speeds well over 200 miles per hour. Scott Dixon earned his third Izod IndyCar Series Championship in 2013. He won his first IndyCar race ever in 2003 which led to his first championship that year followed by a second crown in 2008. His 32 total IndyCar wins make him one of the most successful drivers of the modern era. 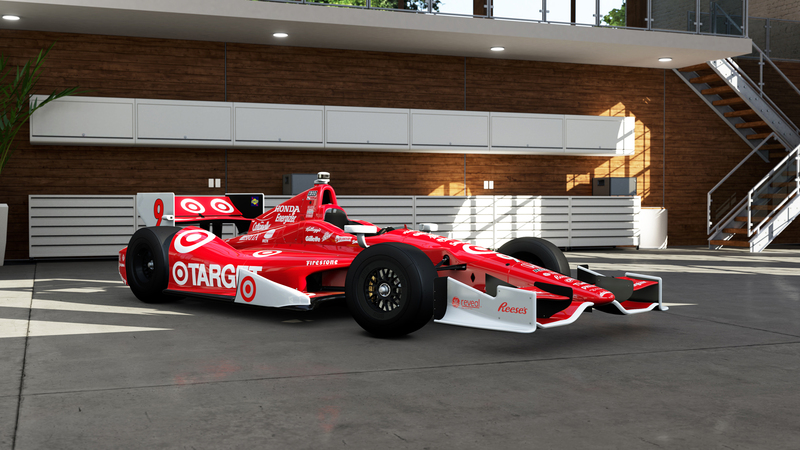 Chip Ganassi Racing has been sponsored by Target since 1990 and has brought home many victories and championships. The #9 Honda powered Dallara saw ups and downs in the 2013 season and together with Dixon at the wheel succeeded in delivering the ultimate goal of winning the series. Can you reign in its power on the tracks of Forza Motorsport 5 and create your own racing history? Now is the time to find out. When Honda asked its loyal owners to state what they would change in the current Honda Civic Coupe, for the most part they just heard silence. It’s no wonder; the current model sells like hotcakes, has a loyal enthusiast following, and, among entry level coupes, the Civic Si’s power and handling are in the upper echelon. The one thing folks did wish for was a more distinctive look to set it apart from the look of the Civic sedan. 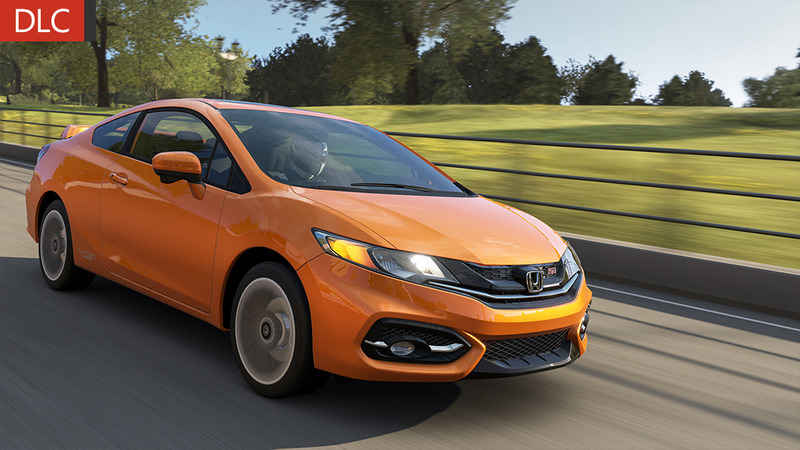 Honda responded with the distinctive, head-turning lines and class-leading performance of the 2014 Civic Si. Wider front fenders with aggressive arches, a wide grill with and evil grin, and a front bumper with a huge air dam and a molded rear diffuser in the rear. The result is something that looks as fun to drive as it actually is. The Civic Si delivers an exciting driving experience with 205 horsepower and a stiffer suspension hooked up to larger wheels offering more rubber to grip the road with. You don’t have to be young to own a Civic Si, but driving one will inspire youthful smiles every time you turn the key. Forza Motorsport 7 immerses players in the exhilarating thrill of competitive racing. From mastering the new motorsport-inspired campaign to collecting a wide range of cars to experiencing the excitement of driving at the limit, this is Forza reimagined.